In a historic sense, we have officially begun the era of America 2.0. Many political pundits and Presidential historians will make a living for the next generation with analysis of what the Presidency of Barack Hussein Obama will mean for our collective futures. My angle is simple and parallels the major technological force that is reshaping our society, Web2.0. In Presidential terms, there have been a few major inflection points in our history. If you doubt this just ask a grade school student. There was Washington and the creation of our nation, Lincoln and emancipation and the Civil War, Franklin Roosevelt for the New Deal, World War II, and the Great (first?) Depression, Lyndon Johnson for civil rights, and Reagan for the the fall of the Soviet Union. In each case history can be starkly categorized in a before and after view. In communication technological terms we had similar points of demarcation such as the invention of language, use of written alphabets, scrolls and books, the printing press, mail service, libraries, telegraph, radio, television, telephone, wireless communications, computers, the Internet and now Web2.0. President Obama came to power in the midst of, and partly because of, the changing societal norms in the way we all communicate. Franklin Roosevelt with his fireside chats, mastered radio as a communications vehicle. John Kennedy mastered the medium of television and Ronald Reagan combined television with a mastery of the pulpit at Evangelical Churches to communicate his message. President Obama is the first Web2.0 President. The real message here is that we have now passed the tipping point for Web2.0. This is no longer an election story, but one that will be commonplace in how we move forward as a society. Web2.0 will be part of all future marketing campaigns as well as political movements. The 10’s of millions of “friends” in the various Obama social networking groups do not cease to exist on January 21, 2009. Social Networks live on. These lists will grow, will influence, will be influenced, and will become the number one asset in the inevitable re-election campaign of 2012. With a new found appreciation for the power of Web2.0, marketing organizations, brands and other organizations are jumping into this medium. How compelling was it to watch the inauguration on CNN’s web page with all of your Facebook friends scrolling their comments, compared to “Katie Couric 1.0” on one-way, non-interactive broadcast television? During the Inauguration I got recommendations from a relative in Israel, in real time, to befriend someone who was posting their reactions and photos, live from the Washington Mall by way of Facebook. My high school class recently started a virtual reunion on Facebook. This class was very much shaped by the titanic forces of the civil rights movement and the Vietnam war. We had an integrated school district with busing in a community that was largely segregated. To share the joy and amazement of what we witnessed this week with some long lost schoolmates was fantastic. Twitter, MySpace and Youtube were all a buzz with a constant flow of words, photos and videos. We are all connected in a way that has tipped the political landscape. During his speech, President Obama stated that the old rules no longer apply. There are many ways to interpret this statement. One way is that we are so connected with Web2.0 that the old rules of controlling mass public opinion are just that, old. Social networks, whether formed for political purposes, commercial marketing or high school reunion’s organically exist, grow and feed amongst themselves. They are the new medium for mass communication. The important lessons from history are that this change, this inflection point, is not inherently good or evil, it just is. Its power is in how it influences our real lives. In the case of President Obama, it has affected all of our lives and perhaps the future history of the world for the next generation. It is up to us to determine the uses. Will it continue to empower self expression and sharing of ideas or become an even more powerful mechanism for controlling public option? We are now sitting at a point in history that will be written about for the next 100 years. The choice is how we use this new communication medium is ours. What is your mobile homepage? And does it matter? 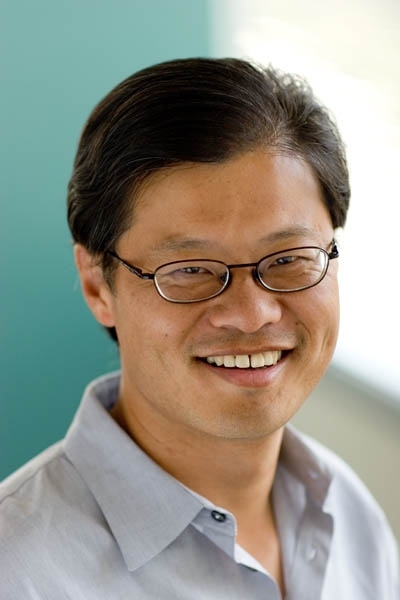 The exit of Jerry Yang from Yahoo got me thinking about the implications, if any, it would have for mobile. In the desktop browser world, the fight for your homepage has been waging for years between Yahoo, Microsoft, Google, AOL, and anyone else who managed to hijack it. The theory is your homepage selection drives page views, which in turn drives advertising revenue. More views equal more bucks. So, what does this mean in a mobile device context? Does homepage matter? What is particularly interesting in the mobile domain is the competing paradigms for driving traffic. There is the “traditional” browser homepage war, the mobile desktop icon, a range of Java or Brew applications, and widget portals. The key question is what to you want to do with your mobile device when you access the Internet and how best to get the answer you want. A second factor is despite the proliferation of full keyboard mobile devices; the long-winded entry of URL’s and the point and click model of a desktop still does not translate well in the mobile arena. 4- Widgets and Portals that are a collection of widgets. Here is my solution – let me know if it matches what you have or you have a different use model. When I access the Internet on my mobile it is usually about answering a particular question or reading a specific newspaper or blog. I have my homepage set to the minimalist Google mobile. I can enter anything I want in the search box, from a website I want to visit to a question. This is a very functional model for me when I need business information or just want to impress family and friends with some arcane trivia. Did you know that the state bird of Alaska is the Willow ptarmigan? For routine information and entertainment I use the very easy downloadable bookmark icon. The icons I have on my device are: NY Times, Washington Post, ESPN, MLB, NY Yankees, Weather Channel, CNN, CNBC and ABC News. This library of information is great for those commuting train trips. In 25 minutes I can catch up on the news, read my favorite editorials, and follow the local sports teams. This is very efficient for sites I visit often, and much better than bookmarking these sites within the browser. This is another good example of the difference between the desktop and mobile experience. Next, I have certain downloaded applications that I use often. My favorites are VZW navigator, followed by Google maps and iskoot (for Skype). For navigation applications I am asking my device a specific question and getting a specific answer. It is either, “How do I get to….”, or “ Where I am and how did I get here?” I use Skype on my desktop and there are rare occasions that I us it contact a business associate. Iskoot works well and is free. The next category of applications isthe content aggregation portal. I have two examples that I have on my device. The first is a very good RSS reader called Viigo. You can easily set up the blogs that you follow and they also have pre-loaded feeds that you can keep or easily delete. If you want to follow this blog on your mobile device, this is the solution. I have also downloaded a specific RSS reader from “The Hockey News”. If you read this blog regularly you know I am a big Hockey fan. I am sorry to say the Hockey New RSS portal is poorly executed and rarely gets used. This should be bad news to the editors at the Hockey News. If a diehard mobile guy who is also a diehard hockey guy finds your mobile application to be poor, it is time to rethink. I make the same offer to you as I did to the New York Rangers. I will volunteer to fix your mobile application. 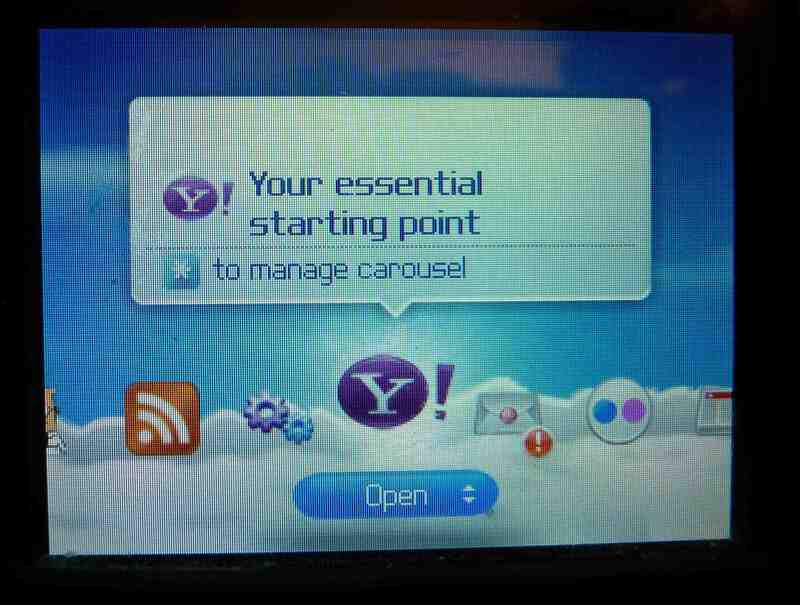 Lastly, the widget portal that I have downloaded is “Yahoo Go! “. In my view, this is a good implementation for the wrong paradigm. Yahoo Go! Is a mobile version of the “My Yahoo” desktop homepage. It has lots of general information categories in a very slick carousel interface. What is interesting is that, although I have used Yahoo as my desktop homepage for 10 years, I almost never use “Yahoo Go!”. The reason for my low use of this service is simply that I have no reason to use it. It does not function as a way for me to get quick answers (Google), quick information (Icons), or navigate (VZW). 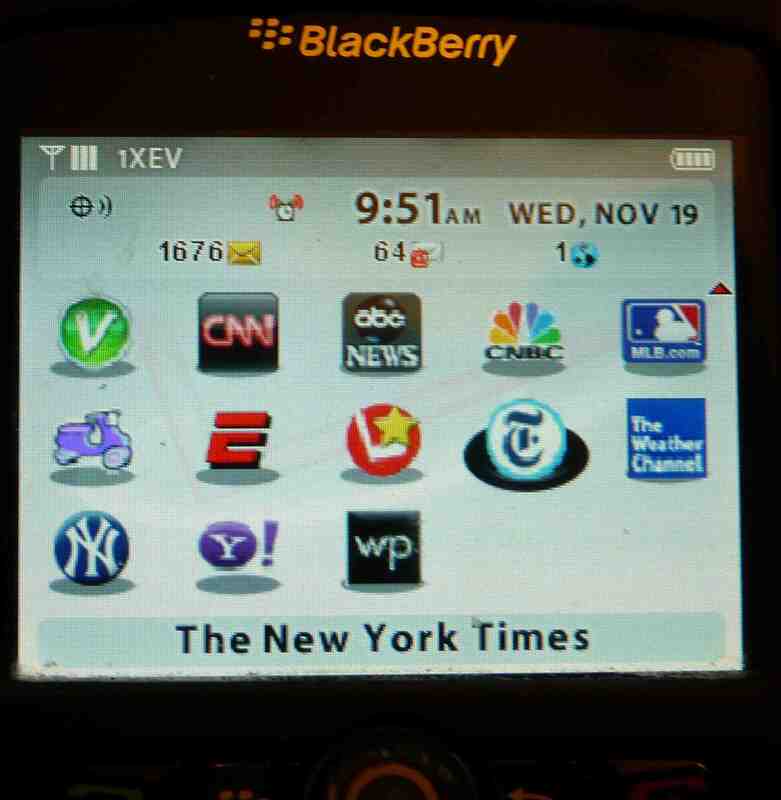 It is interesting to speculate what Obama had on his Blackberry? The Iphone, G1, HTC and other large screen devices can easily enable similar models. With advertising revenue the ultimate goal, understanding the mobile desktop paradigm is step one. We can hope that the successor to Jerry Yang will re-think the mobile environment to be truly mobile and not just a transposition of the desktop. Will the Yahoo and Google be the only advertising game in down, or will quick footed start-ups like Mojiva make even bigger inroads in this lucrative market? Please share with me what you have on your mobile desktop. I will collect the input for a future blog article. Sometimes if you just take a moment for deeper observation at an event you can get a sense of what pundits spend a lifetime interpreting. Last night I took my youngest daughter to a Ranger game. They lost in overtime, 3-2 to the Edmonton Oilers, so I will not dwell too much on the fantastic comeback, the grit and determination and the ultimate let down. My daughter sent and received approximately 120 text messages. She communicated to classmates about the homework she would have to do when she got home, she chatted with her cousin about God knows what, She took three calls, and she cheered the loudest in are section. She does not have ADHD, she just multitasks at the rate of a cyborg!! This is the next generation. Throughout the game the roving camera guys put crazed fans on the big jumbotron. Twice last night, the fan was wearing a big Obama button on their Ranger jersey. When they saw themselves on the arena scoreboard instead of pointing to their Ranger emblem, they pointed to the Obama button! 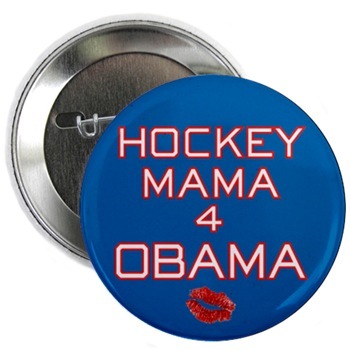 If seems the hockey Mom and Dad demographic in New York went for Obama. 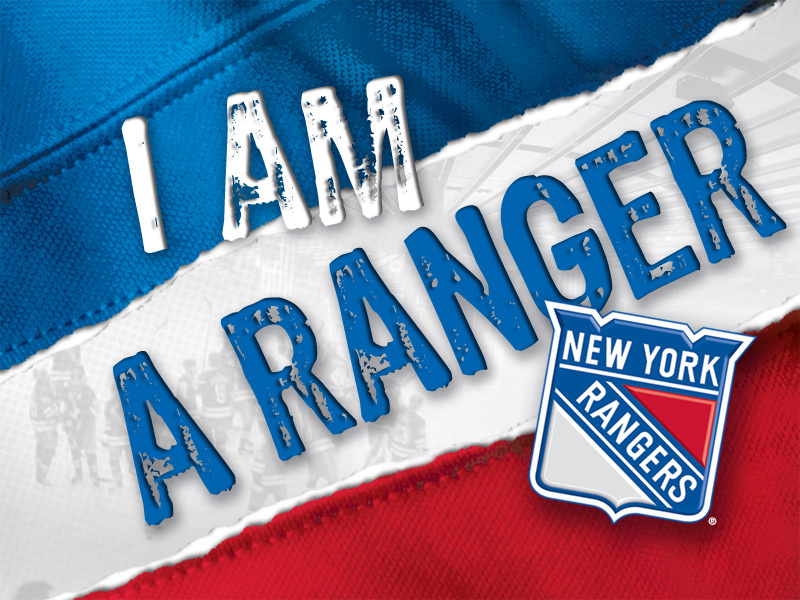 The Rangers have several interactive mobile promotions during the game. The simplest is a text to screen application where your message is displayed on the scoreboard. What is “interesting” is that you text to one shortcode, get a thank you message from another shortcode and then are instructed to text a third shortcode for a free wallpaper. Also, the thank you shortcode responds with “Thank you for voting!” Opps? Did I vote? Time to check that campaign provisioning! I herby offer – pro-bono (maybe you can pay me with an autographed stick) to fix your mobile applications to make them coherent and effective; to have them run on one shortcode, with proper messaging before, during and after the user interaction. I made a quick count on the number of empty luxury suites last night. I stopped counting after 23. Madison Square Garden has about 60 suites for the well-heeled New York corporate crowd. While I have seen empty suites in the past, the number of dark boxes is very large. As a proxy for the recession/depression on Wall Street, just counting the number of flipped light switched on luxury boxes is a leading indicator of the economy. Since the Rangers were playing a Canadian based team, the national anthems of both Canada and the U.S. are sung before the game. I like the Canadian Anthem, and can sing it with the best of them. I have to admit I was never quite sure who Canadians are “on Guard” from? Anyway, I observed a very large number of Edmonton Oiler fans, from Canada. This is unusual. Usually the out of town fans come from New Jersey, Long Island and Philly. This got me thinking. Is there some other geopolitical trend that has caused these fans to be in New York? I came to three possibilities – either they paid for a tour before the dollar increased in value, or they all work for oil companies in Edmonton and have more money than they know what to do with, or they are Canadian “snow birds” who escape the harsh Canadian winter to bask in the less harsh New York winter. You decide. Amazing what you can observe if you just take a minute to look! Would you have invested in this start-up? Its made over $500M! The World’s most successful E-Commerce Start-Up is planning a successful exit after just 24 months. Imagine you are an Investor listening to this company’s pitch. The date is early 2007. Decide if you would invest. The business plan shows projections of almost $500M in revenue by 3Q2008. They estimate in excess of 40M registered users with average revenue per user “purchase” event of over $80. There will be a significant amount of return uses. Users will gladly opt-in to your marketing messages and receive upwards of 7 promotional emails per week. The opt-out rate will be quite low. Many of the subscribers of this service will also gladly donate their time to this company to help promote its leadership and mission. The product will be promoted via a combination of online advertising, mobile shortcodes, television, radio, print ads. Most importantly,there will be personal appearances by the company’s charismatic leader. He will draw crowds in excess of 50,000 to hear him speak. Included in the investor pitch deck is a plan for a 30 minute infomercial in prime time on 5 national networks. Oh, and the product that people are getting for all this money? This company plans a successful exit on Tuesday. Regardless of your politics, you have to admire the unprecedented E-commerce effort of the Obama team. Over the past 2 months we have polled the Upoc community 5 times on presidential candidate preferences. These polls are by any evaluation unscientific. Before I reveal the answers, it is important to disclose that in 2004 we polled the community on their choice for President Bush or Kerry, Let’s just say that the outcome of that poll, had it carried through to the real election, would have changed the history of the world over the past four years. Kerry won that poll by around 15%. We asked the community about their preference of Democratic Candidates, then each of Hillary and Obama vs McCain, and lastly if Obama should take Hillary as a running mate. The preference of the community was strongly for Obama. When given the choice of Obama Vs McCain, Obama won by 20 percentage points. Interestingly, when given the choice of Hillary vs McCain, she also won by about the same margin. So, while Hillary was a clear second choice for our social network, if she had won the nomination they would have supported her. This is an interesting outcome that somewhat contradicts the generally accepted generation gap in Obama vs. Hillary supporters. This past week we asked the network if Obama should take on Hillary as his running mate. The result was “Yes” by around 20 percentage points. I found this result also surprising, although had we presented a choice of several VP possibilities, the result might have been different. It would be interesting to see similar polling from Facebook and MySpace. Is it a matter that the social networks are more left leaning (Younger demographic) in their views? Or are the Republicans just less responsive to social networking polls? “Rock the Vote engages youth in the political process by incorporating the entertainment community and youth culture into its activities. From actors to musicians, comedians to athletes, Rock the Vote harnesses cutting-edge trends and pop culture to make political participation cool. Upoc has been a tool of political organizers for the past two presidential elections. Regardless of political affiliation, Upoc has informed, organized, communicated and motivated supporters through cutting edge mobile applications. Our affiliation this election cycle with Rock the Vote is truly special. Upoc will be utilizing our array of social networking capabilities to engage and energize youth voters. From SMS alerts, to polls, quizzes, celebrity debates and general topic chatting, Upoc will positively contribute to increased voter participation in the critical youth demographic. Through its sophisticated data analysis, RTV has determined that a young voter who is engaged with a mobile community is more likely to actually vote. In the past election RTV registered over 1 million first time voters. In this election year, RTV has already registered over 500K new voters just in the primary season! When you couple the registration drive with increased voter turnout in the demographic, the youth voice in the election become undeniable. Given the incredible closeness of the past 2 presidential elections, having this number of new motivated voters is not only significant, but could very well be deterministic. To quote Abraham Lincoln,” Democracy is the government of the people, by the people, for the people.” The activation of a large segment of “the people” materially contributes to our democracy. In short, I am personally proud to be able to utilize all the tools of my trade to apply to such a worthy cause as youth voter registration and voter turnout. I believe that this will impact the selection of next President of the United States and therefore the future that we will all experience. What could be more important or satisfying? Comments Off on Upoc Rocks On!